Previous China trip posts: Shanghai, Hangzhou, Huangshan, Kunshan, Xi’an. From Xi’an we flew to Beijing, China’s capital, and the last major stop on our trip. Beijing was actually my most anticipated city, and it did not disappoint at all. It has all the grandeour of a capital, with huge roads, squares, monuments, buildings, and such. But it also felt much cleaner and better organized than Shanghai. I’m sure the 2008 Olympics, and the related construction work, helped a lot. Beijing has a lot of traffic as well, on the various ring roads and between them. The infrastructure, the size of things like roads and parks, is very impressive. We went to the Great Wall, of course, which was my favorite part of the whole trip. It’s every bit as big, grandiose, and impressive as you might imagine. Simply a can’t-miss visit. We hiked a bunch up and down the wall in the Badaling section, and it was also a beautiful weather day. In general, the weather in Xi’an and Beijing was much better than the weather in Shanghai and its surrounding region. It was just as hot, or almost as hot, but with much less humidity. We also had a couple of days of clear blue skies, which was lovely. We also went to the Forbidden City, of course, to see where the emperors lives. It’s big and impressive, too. Still, it felt somewhat bare, too large maybe. Also, a lot of the buildings were just not as impressive up close, when you looked inside. Maybe a lot of stuff has been removed from the insides. 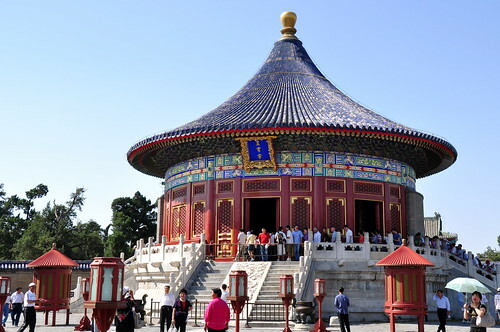 The Temple of Heaven (Tian Tian) was another star Beijing attraction, and I really liked it. Beautiful, small compared to the Forbidden City, but exquisitely detailed, much more so than the Forbidden City. We walked over to Tiananmen Square, and around it to check out the various big buildings. Of all the buildings, the only one I went inside is Chairman Mao‘s mausoleum. That was fascinating. Tons of people, walking quietly in an orderly fashion, to pay their respects. It was the quietest out of all the places I’ve been in China, including our hotel rooms in the middle of the night. On the way to the Great Wall, we visited the Ming Dynasty Tombs. Those were cool, and worth the detour I suppose, but only because they were along the way to the Great Wall anyways. Otherwise, I wouldn’t have rushed there. One of the last things we did in Beijing was a hutong tour. Hutongs are the old, crowded, relatively run-down neighborhoods of Beijing. Some of them are preserved now, somewhat as tourist attractions, but definitely very lived-in. It was interesting, but felt touristy and not particularly different from poor neighborhoods in any other country. We visited a local family in the hutong for lunch, and they were very nice. The tourist shopping places we were taken to, like the pearl market and the cloisonne factory, were a total waste of time. Over-priced, aggressive sales people, just not worth the trip. I’d encourage you to insist on skipping them, if you can. There is plenty of good shopping right on the street, in various shops and markets. Just skip the tourist destinations. In Beijing we also saw a kung fu show. It was more artsy and less fighting than I wanted, but still interesting. Excellent music, impressive physiques. Warmly recommended. We drove past the Olympic village and its structures. The Bird’s Nest and the Water Cube are both very impressive, and worth visiting. Overall, I liked Beijing the most out of all the cities we visited. It’s a nice combination of big without being stifling, impressive but with rooms for privacy and quiet.